Team White beats team Blue in Overtime! (plus a giveaway) - Very Barrie Colts | A website covering the Barrie Colts of the OHL. 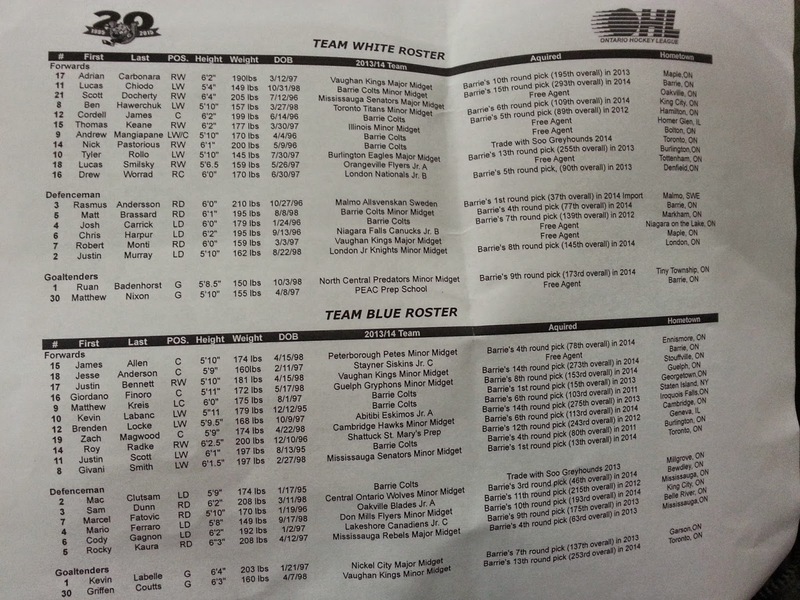 verybarriecolts Friday, August 29, 2014 ,Barrie Colts ,blog ,Blue and White game. 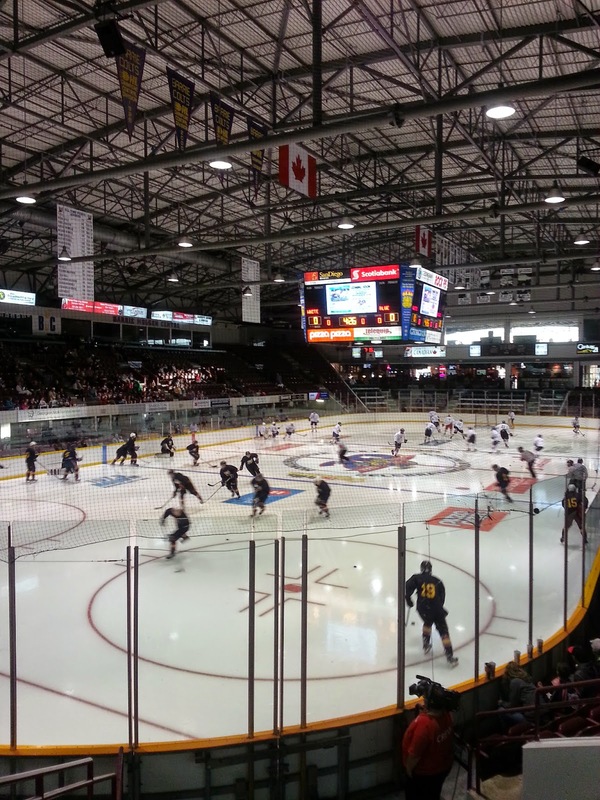 Last night at BMC the Barrie Colts held their 20th annual Blue and White game. There was a pretty solid crowd in attendance who enjoyed free hot dogs and pop that were provided by the team, as well as the chance to meet and get autographs from a few players which included Jonny Laser, CJ Garcia and others! The game started off with Kevin Labelle (Colts 7th rd pick/2013) in goal for team blue and Ruan Badenhorst (Colts 9th rd pick/2014) backing team white. It was not long into the game before team white would jump on the board after Andrew Mangiapane scored a little over 3 minutes into the first period. Scott Docherty of Oakville, On was credited with the assist. Not even two minutes following that, team white would tie the game up at 1 when Justin Scott put one past Badenhorst with an assist going to Roy Radke who is a Colts 12th round pick from the 2012 draft. That would be it for goals in the first period. Both teams were tied 1-1 headed into the second. The net minders on both ends had 13 shots each in the period. Much like the first period, team white didn't wait long to take the lead after Adrian Carbonara (Colts 10th rd pick/2013) would score with assists going to free agents Robert Monti and Lucas Smilsky. Again, the blue team would not let team white hold the lead for much longer than a minute when Mac Clutsam would tie things up at 2 with helpers going to Matthew Kreis The Colts first round pick in this years draft, Givani Smith. A little bit past the half way point both teams swapped their goalies out. Matthew Nixon in net for team white and Griffen Coutts (Colts 13th rd pick/2014) for team blue. With almost 2 minutes remaining in the 3rd, team white would take its 3rd lead of the game when Lucas Chiodo (Colts 15th rd pick/2014) scored assisted by Barries 1st overall pick in the 2014 import draft, Rasmus Andersson. The 2nd period would end with team white leading 3-2. The 3rd period was by far the most eventful, seeing as many goals as the first two periods combined. 5:41 seconds in team blue would tie the game at 3 after Roy Radke scored getting his second point of the night with an assist going to Mac Clutsam. Team white would score just before the 12 minute mark when Andrew Mangiapane scored his second of the night. Just before the 16 minute mark though, team blue put up 2 goals just six seconds apart to take the lead 5-Roy Radke and Justin Scott scored while Brenden Locke, Justin Scott and Givani Smith got assists. 36 seconds later, Drew Worrad (Colts 5th rd pick/2013) would tie things up 5-5 for team white which would be enough to keep both teams locked headed into overtime! The teams would need almost the entire overtime period to get a winner when Thomas Keane of team white would score in the last second of the frame, giving team white the big 6-5 win. Robert Monti got the assist on the game winning goal. Now the team has more cuts to make before heading into their first exhibition game of the season which will be held this Sunday against Owen Sound. 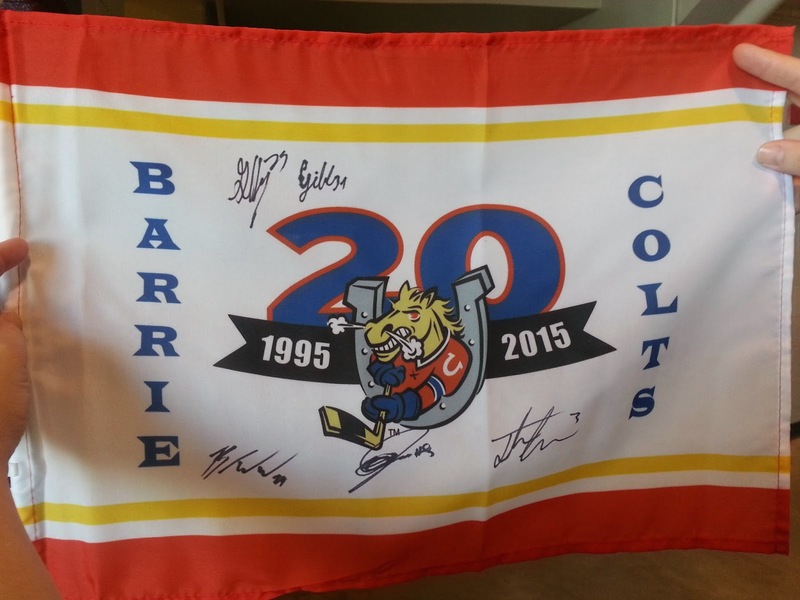 The players were kind enough to sign a 20th anniversary Barrie Colts flag. Over the next couple days we will give it away. Laser, Garcia and others were kind enough to sign it. We will be announcing details on our Twitter and Facebook pages so be sure to follow us there to find out how you can win! Labels: Barrie Colts, blog, Blue and White game.